The Energy Development Co-operative Ltd (established in 1997 and based in Suffolk, UK) is opening it's Iberian division in 2010. The core business is supplying renewable energy technologies for off-grid applications. 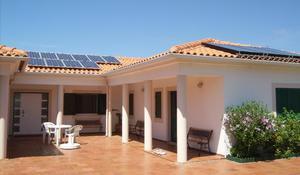 High quality, stand-alone, solar and wind power solutions. Experienced System Design Team design power systems for a wide variety of applications, for use anywhere around the world. When the house was purchased by the current owner in 2005 it was neither warm nor energy efficient. The water heating was by gas. The cooking was by gas and electric, and the space heating in the winter was by solid fuel fireplaces and a wood burning stove. Lovely as a summer home but the heating was not ideal for winter use. Image below taken Christmas 2008 - Beach view from the living room window. Utility Costs now down to Zero. Toasty warm in the winter.